We have the Doll Festival on March 3. Most families with girls display dolls for the Doll’s Festival called Hina-ningyo. It's the day to pray for healthy growth and happiness for young girls. Long ago, people threw paper dolls into rivers and in the sea to drive away evil spirits with them. Hina Ningyo depict the imperial court. They are dressed in beautiful ancient court costumes. 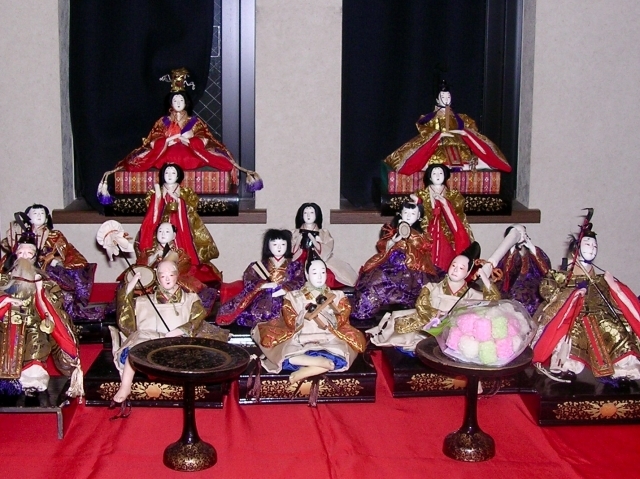 A set of dolls includes the Emperor（odairi-sama), the Empress（ohina-sama), three court ladies（sannin-kanjo), five court musicians（gonin-bayashi), the minister of the left（sadaijin), the minister of the right（udaijin) and three servants（sannin-jougo). People put away Hina Ningyo as soon as Hinamatsuri is over. It is believed that if people put away Hina Ningyo too late, the girl will get married late in the future. Today, we eat traditional dishes like Chirashi Sushi and clam soup for the Doll Festival.